Tinker’s Cat Cafe • You can grab something to drink and eat and hang out with the felines. (Scott Sommerdorf | The Salt Lake Tribune) Melissa Davis, left and Jackie Rogers play and pet cats at Tinker’s Cat Cafe on 900 South in Salt Lake City on Thursday, Nov. 2, 2017. 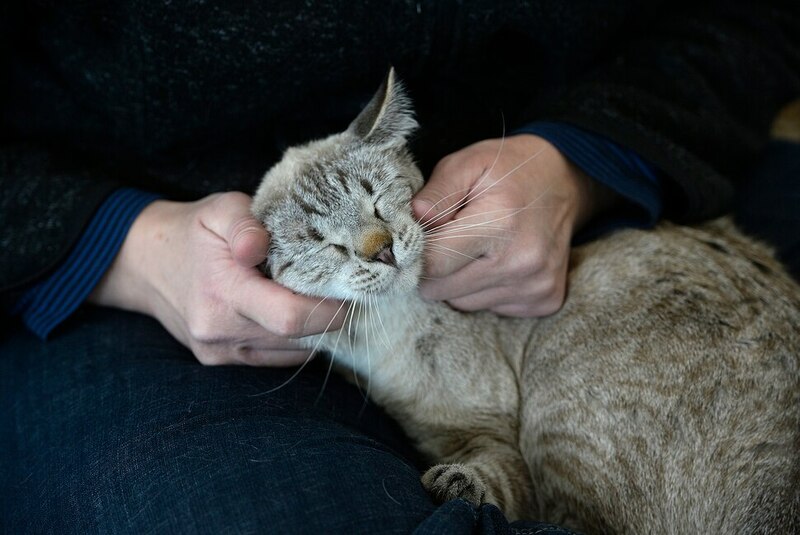 (Scott Sommerdorf | The Salt Lake Tribune) Melissa Davis pets one of the cats at Tinker’s Cat Cafe on 900 South in Salt Lake City on Thursday, Nov. 2, 2017. (Scott Sommerdorf | The Salt Lake Tribune) The mural on the west side of Tinker’s Cat Cafe on 900 South in Salt Lake City on Thursday, Nov. 2, 2017. (Scott Sommerdorf | The Salt Lake Tribune) Melissa Davis, left and Jackie Rogers play with cats at Tinker’s Cat Cafe on 900 South in Salt Lake City on Thursday, Nov. 2, 2017. (Scott Sommerdorf | The Salt Lake Tribune) A cat looks through the cat pass-through at Tinker’s Cat Cafe on 900 South in Salt Lake City on Thursday, Nov. 2, 2017. (Scott Sommerdorf | The Salt Lake Tribune) Melissa Davis, left and Jackie Rogers play and pet cats at Tinker’s Cat Cafe on 900 South in Salt Lake City on Thursday, Nov. 2, 2017. (Scott Sommerdorf | The Salt Lake Tribune) Visitors are given cat ears to wear as they play with the 14 or so cats at Tinker’s Cat Cafe on 900 South in Salt Lake City on Thursday, Nov. 2, 2017. (Scott Sommerdorf | The Salt Lake Tribune) Tinker's Cat Cafe owner Lisa Boone with coffee and a cookie . (Scott Sommerdorf | The Salt Lake Tribune) A cat takes up a position in the cat pass-through at Tinker’s Cat Cafe on 900 South in Salt Lake City on Thursday, Nov. 2, 2017. (Scott Sommerdorf | The Salt Lake Tribune) Melissa Davis, left and Jackie Rogers play with cats at Tinker’s Cat Cafe on 900 South in Salt Lake City on Thursday, Nov. 2, 2017. (Scott Sommerdorf | The Salt Lake Tribune) Visitors can play with the 14 or so cats at Tinker’s Cat Cafe on 900 South in Salt Lake City on Thursday, Nov. 2, 2017. (Scott Sommerdorf | The Salt Lake Tribune) A cat lounges inside a piece of furniture at Tinker’s Cat Cafe on 900 South in Salt Lake City on Thursday, Nov. 2, 2017. (Scott Sommerdorf | The Salt Lake Tribune) Melissa Davis pets one of the cats at Tinker’s Cat Cafe on 900 South in Salt Lake City on Thursday, Nov. 2, 2017. (Scott Sommerdorf | The Salt Lake Tribune) Melissa Davis plays with one of the 14n or so cats at Tinker’s Cat Cafe on 900 South in Salt Lake City on Thursday, Nov. 2, 2017. (Scott Sommerdorf | The Salt Lake Tribune) Melissa Davis pets one of the cats at Tinker’s Cat Cafe on 900 South in Salt Lake City on Thursday, Nov. 2, 2017. (Scott Sommerdorf | The Salt Lake Tribune) An upwardly mobile cat at Tinker’s Cat Cafe on 900 South in Salt Lake City on Thursday, Nov. 2, 2017. No, the woman behind Tinker’s Cat Cafe is NOT a crazy cat lady. Lisa Boone likes cats. A lot. But she doesn’t have a lot of them at home. She has one, named Guinness. Well, she’s fostering another dozen or so now at Tinker’s, Salt Lake City’s first cat cafe, which opens on Saturday. In March 2015, Boone was watching “The Amazing Race,” and one of the tasks contestants had to complete was giving milk to kitties at a cat cafe in Thailand. It made a big impression on her. “I said, ‘How come I’ve never thought about anything like that? That’s a great idea,’” Boone said. Two years and eight months later, the longtime yoga instructor has secured a site at 302 E. 900 South that she’s transformed into Tinker’s Cat Cafe. It’s sort of two businesses in one building. In the west side, there’s an espresso bar and a variety of food. You can sit down, drink your coffee and use the Wi-Fi. “It was important to me just to have a place where people can hang out like a regular cafe,” Boone said. 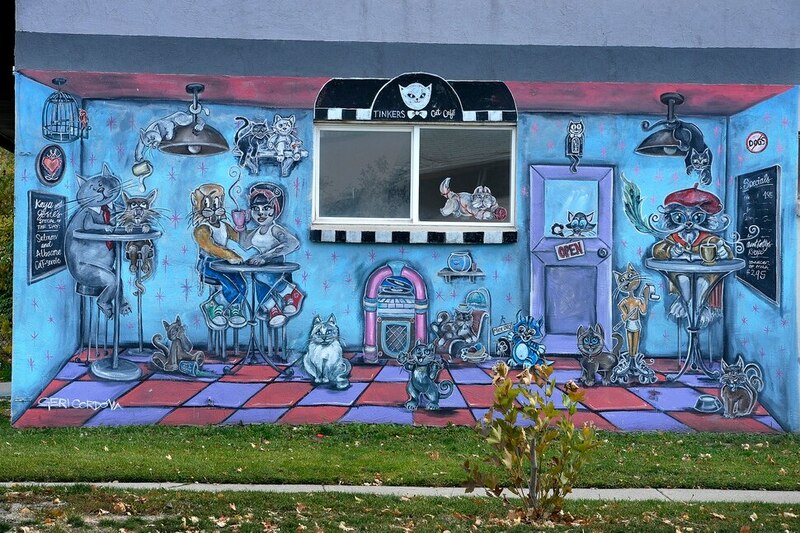 If you don’t pay attention to things like the giant cat mural on the outside of the west wall or the cat-related items in the boutique — or the Tinker’s Cat Cafe signs — you might not notice anything unusual about the place. But you might notice the wall that runs down the center of the building, built at the behest of the Salt Lake County Health Department to keep the cats on the east side of the building. If you’ve made a reservation, you can buy your coffee, pay the $8 hourly fee, step through the door and spend an hour with 12-14 felines. • Don’t pick up the cats. • Don’t pull their tails. • Each guest must sign an online liability waiver. • Please resist the urge to feed the cats your yummy treats. The cats will have a healthy cat food diet to enjoy only. • Let the sleeping cat lie. • Please do not pick up the cats. This helps keep the cats’ stress levels down and your safety up. • No flash photography. All cat selfies are welcomed with general photography. • Children under 12 must be closely supervised. The goal is to find homes for the cats. Boone is working with the Salt Lake County Animal Services, and the cats are all available for adoption. This is also something new for the health department. Except for that wall down the middle of the building; having separate restrooms and cleaning facilities on each side; and the need to keep the cats and the cafe separate. Boone didn’t try to negotiate an on-site kitchen; food will be brought in from other local businesses — “the best bagels in town” from Ditta Caffe, “really cool cat-shaped cookies” from Les Madeleines, “excellent vegan options” from City Cakes & Cafe. “We’ll have nonvegan, vegan, gluten-free — we want to keep everybody happy,” she said. There’s plenty of seating so patrons can get acquainted with the cats. 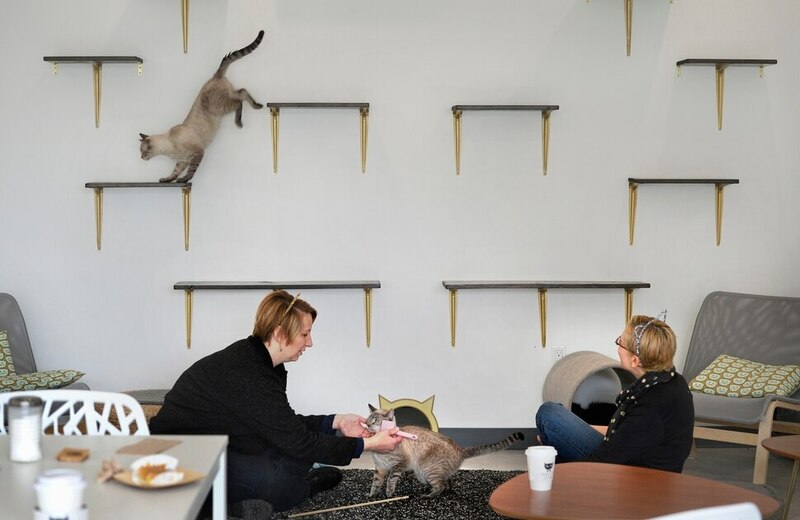 It’s not just about the comfort of the customers — there are places for cats to climb and play. The first customers at Tinker’s soft opening on Thursday did just that. Although Melissa Davis and Jackie Rogers pretty much forgot about their coffee and their treat when they sat down and started playing with the cats. Working with Boone, she arranged for Rogers to be No. 1 on the guest list as a celebration. “Jackie’s just finished a year of breast-cancer treatments,” Davis said. And she’s feeling “great,” Rogers said. Rogers already has a pair of cats at home; Davis is currently cat-less after her pets passed away. “So she’s in the market,” Rogers said. A couple of the cats were especially interested in playing. Others napped. And if they’re not feeling social, the cats can duck into a separate room that’s off-limits to human patrons. The cat part of the cafe is not just for people looking to adopt. Cat cafes became popular in Japan a decade ago because many people live in small apartments that don’t allow pets and the cafes offer cat companionship. Tinker’s is looking to do the same for Salt Lake cat lovers. Maybe college students who miss their cats back home. Or people whose spouse or significant other is allergic to cats. By the way, the cafe is named after — you guessed it! — a cat named Tinker. He was a Siamese her mother had when Boone was born, and he remained part of her life as she was growing up. And opening the cat cafe did result in a new pet in the Boone house … just not the one you expected. Back in May, she went to the animal shelter for a meeting, took a quick look at the cats, then a quick look at the dogs — and ended up bringing home a black lab mix named Murphy.